The Watergate Scandal began a period of Democratic control of Washington that essentially lasted until the 1990’s. Ronald Reagan won the Presidency, but the Democrats controlled Congress. The Watergate Scandal played a role in the Democrats obtaining and keeping that power. It was their high watermark of political influence. There is no doubt in anyone’s mind that they would like to repeat their success. Unfortunately for the Republican party, this time they have a few turncoat Republicans helping them. As Americans, we need to make sure that this sort of manipulation of the news does not happen again. Today we have an alternative media that we did not have then. Hopefully that will make a difference. At any rate, we need to be aware of what is being attempted. As Democrats and some Republicans applaud the appointment of Robert Mueller as special counsel there are some things we need to remember. First of all–no investigation has turned up any evidence of Russian collusion with the Trump campaign to impact the 2016 election. Second of all–the longer these accusations can be dragged out, the more people will accept them as fact. Third of all–if the Democrats can turn the heat up high enough with fake stories, they may be able at least to vote on impeachment. The don’t have the votes to impeach President Trump, but impeachment hearings might win them some votes among some Americans (or it could seriously cost them votes as the impeachment of Bill Clinton cost the Republicans votes). What we have watched this week is political theater. Unfortunately it is political theater played without any sense of truth or fairness. It is a glaring example of the fact that the swamp in Washington needs to be drained–and Donald Trump is not the problem. The media has created chaos with anonymous sources and unseen memos. The chaos is not from the Trump Administration, it is from a media that is trying very hard to reverse the votes of the American people. I will admit to being young and stupid in 1972. I read the papers and watched the news and decided that Richard Nixon was a crook. I voted for George McGovern because he wasn’t a crook. For me it was that simple. I was quite satisfied with myself until about a year ago. I heard a discussion from some people I respect that caused me to revisit the situation. I am now reading a book called The Secret Plot to Make Ted Kennedy President by Geoff Sheppard. I’m not big on conspiracy theories, but there are some basic facts in this book that are hard to ignore. The book explains the relationship between the Kennedy family and the media and details some of the ruthlessness of the Kennedy family. The book reminds us that after the accident at Chappaquiddick that resulted in the death of a young woman, there were some strange turns in the pursuit of justice. On July 18, 1969, Ted Kennedy drove off a bridge at Chappaquiddick and Mary Jo Kopechne, a passenger in his car drowned. The accident was not reported to the authorities when it happened. Ted Kennedy was interviewed by the police (and press) the following day when fishermen discovered the car and the body and the car was traced to the Kennedy family. When the case came to trial, Judge James Boyle sentenced Kennedy to two months’ incarceration, the statutory minimum for the offense, which he suspended. In announcing the sentence, Boyle referred to Kennedy’s “unblemished record” and said that he “has already been, and will continue to be punished far beyond anything this court can impose.” Sometimes it pays to be a Kennedy. Watergate was a simple burglary which was stupid, dishonest and unnecessary. From what I have read, Richard Nixon was not aware of the burglary ahead of time and was not aware of the cover-up until very late in the game. By then it was too late. When John Dean realized that he was in trouble, he hired a lawyer—a lawyer very close to the Kennedy family. Behind the scenes, Ted Kennedy was directing the Senate Committee and the investigation. Dean’s testimony was carefully scripted to have the most impact. The media was in on the deal. It is telling that when Archibald Cox was sworn in as the Special Prosecutor in the Watergate Case, at least ten members of the Kennedy family attended the swearing in. Somehow the media overlooked that fact. I realize that this is old news, but I bring it up for one reason. Ted Kennedy wanted to be President, and Watergate was a distraction from the baggage of Chappaquiddick. He was able to enlist (either verbally or non-verbally) the help of the media in a ‘get-Nixon campaign’ that would clear the way for a Kennedy Presidential victory in 1976. He made sure the Watergate Investigation dragged on, the indictments were delayed, and the testimonies had the maximum impact. The goal was to permanently destroy the Republican Party and clear the way for another Kennedy to become President. It didn’t matter what the truth was—it mattered what the American people were told and expected to believe. Because there were only three network news sources at the time, all moving in the same direction, it worked. I believe we are going to see the same kind of coordinated attack on Donald Trump when he becomes President. We have a few things going for us that we didn’t have then—we have alternative news sources. The left is currently trying to discredit those sources as ‘fake news’, but many Americans are not fooled. There may be an attempt to shut down or totally discredit internet news (Facebook is already hiring fact checkers with liberal political connections). There is also the fact that Donald Trump is not inclined to claim that he is perfect. He has an ego, and he will tout his business success, but I haven’t heard him claim to be perfect. Be prepared to tune out a lot of the attacks on Donald Trump and his administration that you hear. I am sure he will make mistakes, but I can guarantee that he is not capable of doing all the things the Democrats will accuse him of—there are not enough hours in the day! Fasten your seat belts! Get out the popcorn! Pray for America! CNS News posted an article today about the discussions the mainstream media has been having about the Electoral College. Many of the mainstream pundits are convinced (and have tried convincing Americans) that the Electoral College is something we no longer want or need. So how is the public reacting to being told to abolish the Electoral College? We are not impressed. I guess there were a lot of people who were actually happy with the way things worked out! 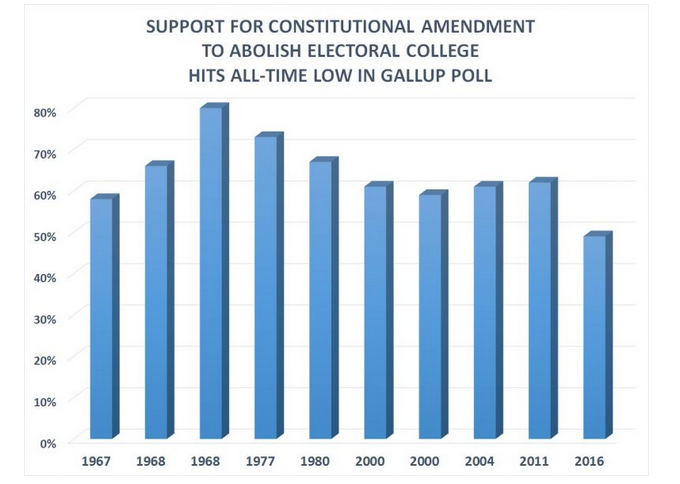 In all ten surveys done by Gallup, the greatest support for amending the Constitution to eliminate the Electoral College came in a November 1968, just after that year’s election. So much for the media coverage of the Electoral College. As the investigation into the Internal Revenue Service (IRS) continues and the Democrats continue to obstruct the investigation, there is one part of the investigation that is finished. Scott Johnston at Power Line reported yesterday that under a consent judgment entered earlier this week, the IRS agreed to pay $50,000 in damages to the National Organization for Marriage (NOM). The IRS released the donor list of NOM to a gay rights group that opposed the legislation NOM was supporting. NOM’s statement on the settlement is posted here. The statement quotes NOM chairman John Eastman: “In the beginning, the government claimed that the IRS had done nothing wrong and that NOM itself must have released our confidential information. Thanks to a lot of hard work, we’ve forced the IRS to admit that they in fact were the ones to break the law and wrongfully released this confidential information.” Hmmmm. That sounds strangely similar to what is happening in Washington in the investigation of the IRS’s targeting of the Tea Party. Reminder: The charge that Richard Nixon “endeavored” to misuse the IRS made its way into the second of the three articles of impeachment voted against him by the House Judiciary Committee. Nixon’s efforts to misuse the IRS were futile. They went nowhere. Nixon and his henchmen desired the IRS to “screw” their political opponents, but their efforts were a pathetic failure. We have had Presidential administrations in the past that were very good at hiding information from the American people, but the Obama Administration has turned stonewalling into an art form. Scott Johnson at Power Line posted an article today about the latest wrinkle in the investigation into the misuse of the Internal Revenue Service (IRS). The IRS has informed the House Ways and Means Committee that it has lost Lois Lerner email messages from January 2009–April 2011. Harkening back to the allegedly accidental erasure of 18 1/2 minutes of critical Oval Office recordings that contributed to Richard Nixon’s resignation from office, the IRS attributes the loss of Lerner email to a computer crash. Some email survives: the agency retains Lerner email to and from other IRS employees during this period. The IRS claims it cannot produce email written only to or from Lerner and outside agencies or groups, such as the White House, Treasury, Department of Justice, FEC, or offices of Democrat congressmen. Funny how that works. I know that this has been said so many times it is a cliche, but can you imagine what would happen if this occurred under a Republican President? On Wednesday, President Obama made a speech to the Business Roundtable. Yesterday the Washington Post awarded the speech four pinocchios. So what did the President say that wasn’t true? In 1973, when Richard Nixon was president, Democrats in the Senate, including Sen. Edward Kennedy (D-Mass.) and Sen. Walter Mondale (D-Minn.), sought to attach a campaign finance reform bill to the debt ceiling after the Watergate-era revelations about Nixon’s fundraising during the 1972 election. …In 1982, Senate Majority Leader Howard Baker unleashed a free-for-all by allowing 1,400 nongermane amendments to the debt ceiling legislation, which resulted in five weeks of raucous debate that mostly focused on limiting federal court jurisdiction over school payer and busing. The debt limit only passed after lawmakers decided to strip all of the amendments from the bill. …One of the most striking examples of a president being forced to accept unrelated legislation on a debt-ceiling bill took place in 1980. The House and Senate repealed a central part of President Jimmy Carter’s energy policy — an oil import fee that was expected to raise the cost of gasoline by 10 cents a gallon. Carter vetoed the bill, even though the United States was close to default, and then the House and Senate overrode his veto by overwhelming numbers (335-34 in the House; 68-10 in the Senate). Please see the article at the Washington Post for more examples. I understand that politicians on both sides of the aisle have been known to stretch the truth for their own purposes, but we are at a critical point right now where spending cuts are necessary for the economic survival of our country. ObamaCare represents a very large increase in government spending. We simply cannot afford it right now. Character is one of those seemingly old-fashioned virtues that people mention every now and then. It sounds like something we all should have, but it doesn’t seem relevant to everything. The events of the past few weeks show that it is. Peggy Noonan posted an article in the Wall Street Journal this weekend about the Internal Revenue Service (IRS) scandal. The article details some of the facts of the IRS treatment of conservative groups–including the leaking of donor information for the National Organization for Marriage. That organization did its own computer forensic investigation and determined that the leak of donor information came from the IRS. Since that discovery, the IRS has stonewalled the investigation. The article is very interesting in the examples it gives and the conclusions it reaches–I strongly suggest that you follow the link above and read the entire article. I have already chosen the quote of the week, but I wonder if I can put the following quote up for next week’s Quote of the Week. Let me get this straight–the Accountability Review Board (ARB), led by former U.N. Ambassador Thomas Pickering and former Chairman of the Joint Chiefs of Staff Adm. Mike Mullen, did not feel it was necessary to interview Secretary of State Hillary Clinton because she had already accepted “the full responsibility.” Therefore, it was not important to find out what she knew, when she knew it, or what decisions she was responsible for on the night of the attack on Benghazi or before that night. Wow! How many teenagers would welcome a deal like that?! How did the estimable men of the ARB miss Gregory Hicks in the information gathering phase of their work? The ARB harks back to Richard Nixon’s desired resolution of the controversy over production of the Watergate tapes: The Stennis Compromise. In lieu of producing the tapes, Nixon proposed, bring in some eminent but hearing-impaired older man to check out the tapes and report back. The Stennis Compromise was laughed out of consideration. Only Democrats can get away with something like that. This is truly a sad chapter in American history.